Bose is a good vehicle to use in the effort to reinstall icons from the Congress party and outside overshadowed by the Nehru-Gandhis and the Mahatma. His views led to the formation of the Leftist Forward Bloc but that does not make him an untouchable for India's Rightwing. His obvious nationalism, and a militaristic approach to it, make him a ready-favourite. One of his most-quoted lines, "Give me blood and I shall give you freedom," from his speech to the Indian National Army in Burma in 1944 is the kind of stuff that drives the Rightwing. His life story gives a dimension that is more substantive than merely placing him in the space opposite Gandhi and Nehru and other Gandhian acolytes. In that sense he gets a heads-up when compared to say, Bhagat Singh, the other Leftist icon of the freedom movement. More than politics and ideology, the key words while referring to Bose are nationalism and patriotism. Taking up his cause helps the ruling party to score high on the patriotism index. This is one of the legs on which the BJP's push for new constituencies stands - the others being a wave of welfare populism signified in the budget, talking Bharat ahead of India, and finding ways to ensure its upper caste vote which is illustrated in the move for quota in the general category. 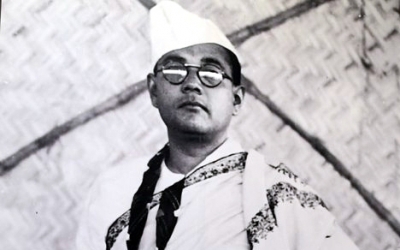 Whether the pursuit of Bose and his legacy by the BJP will polarise the vote bank is an open question. In West Bengal where it is hoping to win at least 20 seats, and the Prime Minister has campaigned aggressively, the party has been moving in stages. There was an elaborate, almost ritualistic celebration of Swami Vivekananda, and Modi has made no secret of the fact that he has been an avid reader of Vivekananda's teachings. Once again, social media has highlighted this. That apart, there has been an attempt to introduce 'shastra pujan', or a worship of weapons, a practice that did not originate in the state. The common thread running through these is nationalism/patriotism. Politics is about legacy. It is a constant. But political choices are like the swing of a pendulum. They move from one extreme to the other. A liberal discourse ruled for a long time. There is now a course correction towards the Right. It has come more than 90 years since the formation of the Rashtriya Swayamsevak Sangh by K.B. Hedgewar in 1925 and over 60 years since the Bharatiya Jana Sangh was founded by Syama Prasad Mookerjee in 1951. The mainstreaming of Netaji becomes relevant in this context. Whether or not the Rightwing discourse is the dominant one will not be determined by the Lok Sabha polls because of the number of factors involved in the world's largest democracy. But it will be a key determining factor.